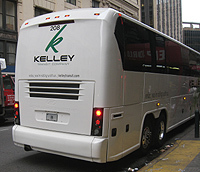 This type started in 1922 as “Jitney”. They had the reverse colors of passenger plates with a J- prefix. 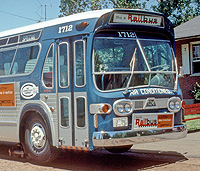 Sometime in the 1930s the type was changed to “Bus” which is used to today. “Temporary Jitney” plates are known for the 1920s, with a TJ- prefix. “General District” Bus plates were used starting sometime in the 1950s. These look the same as regular bus plates (including the “Bus” caption), but have a letter prefix. See section below. 1936. The “Bus” caption was added in the early 1930s, but the “J” prefix for “Jitney” remained. This plate was used in ’56 and ’57. The shiny background didn’t scan too well. “General District” Bus plates were used starting sometime in the 1950s. These look the same as regular bus plates (including the “Bus” caption), but have a letter prefix. They were issued to transportation agencies as a series – for example, A 15, B 15, C 15, etc. Buses operated by The Connecticut Company, formerly the state’s largest streetcar company, used plates of this type. I am not sure when new plates of this type were discontinued, but a couple of existing registrations were carried over into the 2000s.